It occurs to us that there’s a potentially important segment of the population that might be enlisted in the struggle to eliminate high-stakes testing. We’re wondering about the merit of someone younger than us picking up the following bit of fictional dialog and circulating it. Of course, students whose H.S. graduation, grade advancement and/or course grades are dependent on their state test scores should be strongly cautioned to seriously consider the consequences of the strategies implied in the dialog. They should discuss the possible ramifications with their parent(s) before ‘denying them the data’ by refusing to be tested, having their parents opt them out of the testing (in states that permit it) or just marking ‘D’ for each answer. If this cadre could get 50% of all students at each school site to participate it would send a significant message to the ‘reformers’ to change their reliance on testing as the driver for classroom learning and use other methods for accountability and educational decisions. It has been a week since our son took us to San Francisco Airport to take our United flight to Washington, DC. My wife Vincie and I drove up to his home from Fresno on Tuesday,8/26 to spend the night with him, daughter in law and granddaughter before leaving the next morning. We had planned this since March. We heard about the National Call to Action and the Save our Schools’ March earlier in the year. It would be our 45th anniversary in July and my wife and I decided this was something we could not pass up. I had taught for over 38 years and my wife had been very supportive of all my teaching activities-especially during the writing of two books on the effects of testing on students and teachers as well as my activism in battling the high-stakes testing mania. She had always said, “We need to march!” and so we were off. We had a transfer in Chicago. Our plane arrived late so we had to get our 65+ year bodies moving to the next concourse to catch our connecting flight to DC. We barely made it, but our luggage didn’t. We had to wait in DC for an hour until the next plane delivered them. As soon as we left the baggage claim to pick up a taxi to the airport it hit us. The humidity was stifling…not used to this in California..sure its hot in Fresno but we could breath and not feel oppressed. No sooner than we got in the cab then we asked that the air be turned on…a brief relief. Our first thought was that we hoped that our hotel room had adequate air conditioning. It did. This is the first time I have ever heard him speak. His passion for students and teachers, his compassion for the poor and disenfranchised was clear. Early in his teaching career was fired from his job in Boston because he read a poem to his class by Langston Hughes. He marched with Dr. King through the streets of Boston and has been fearless in advocating for those affected by the educational apartheid in so many of our public schools. He brought me to tears often and opened my eyes to the critical nature of our current educational quagmire. He set the tone for my experience at the conference and the march. In the morning session I attended the Parents Across America http://parentsacrossamerica.org/ presentation. I wanted to find our how to mobilize parents to see the damage this testing mania is having on their children. The key step is to gather with parents that are already organized under another banner-PTA, Site Councils,etc. and inform them of the national movement to have their voices heard in educational policy making. Other ideas included creating a carefully worded petition parents can sign at school sites and give out fliers of planned parent meetings. The afternoon session we wanted to attend was canceled, so we decided to go back to our hotel and get the sleep we would need for the evening tour we wanted to take of ‘Washington after Dark’…all in an air conditioned bus, but with a guide and the opportunity to leave the bus at appointed stops. As the Congress and President labored at the debt ceiling issue we got a meaningful sense of the history and significance of those who formed our country and a system that permitted the interactions that were taking place beneath the lit-up capitol dome. In a recent USA Today/Gallup poll shows that a strong majority of Americans support a major overhaul of No Child Left Behind or total elimination of the law. Among all respondents with opinions about NCLB only about a quarter said, "Keep basically as is." Democrats, Republicans and Independents share these opinions in very similar ratios. More precisely: 16% want to "eliminate law"; 41% said, "keep with major revisions"; 21% replied, "keep as basically is"; and 21% had no opinion or did not know enough to say. 1. Recognize that it is unfair and immoral to demand equal outcomes while remaining silent about equalizing the resources at federal and state levels that create the opportunity for children to learn. Funding schools should go to those schools that are in most economic need not by competitive grants. Conduct school site inventories by qualified educational professionals of required educational materials, supplies and experiences and provide the funds in accordance with those needs. Educationally impoverished students require more help. 2. Address economic, social and cultural issues, which are outside the school day yet impair learning. The availability of nutritious food before school and at lunch, community health, and library services will give students the energy and resources they need to focus. It will help keep more students in school, and provide locations for reading, research and study. 3. Improve the most vulnerable schools rather than punishing schools that serve disadvantaged children. Eliminate "turnaround models" (required in Race to the Top) that have no basis in research. Rather help struggling schools by determining which particular site based issues exist that limit a school’s ability to provide for its students; then address those. Do not change the entire school carte blanche. 4. Focus assessments in ways that improve instruction, display real performance, and encourage exploration, imagination, and critical thinking. Eliminate standardized testing. Rather allow for multiple sources of evidence in determining student learning and growth. Respect teachers’ professional autonomy to modify and adjust lessons as dictated by the needs of their students rather than preparation for local, state and national testing regimens. 5. Create a national assessment program which uses sampling following the model of the NAEP and under the guidelines of The Standards for Educational and Psychological Testing, created by the American Psychological Association, the American Educational Research Association, and the National Council on Measurement in Education. It must also be in accordance with the 1974 Research Act requiring informed consent on the part of any tested student. 6. Permit each school site to determine a workable school improvement timeline based on the specific needs of their student population to replace the 2014 dystopian deadline. Each site in conjunction with its state, county, and district staff should join with parents to develop this timeline, with specific goals and appropriate evidence. 7. Encourage funding of art, music, foreign language, career/technical education, physical education, geography, history, and civics in the curriculum, especially in low-income neighborhoods. 8. Evaluation of teachers should not be based on student test scores (value-added methods ) but rather comprehensive methods of looking at all facets of teaching and learning as evidenced in state professional teaching standards. School wide evaluations should be based on high quality accreditation processes developed just for this purpose. 9. Eliminate the use of accountability principles which employ threats and punishments at the site, district and state levels that are intended to prevent professional educators from expressing their views on programs and policies that are permitted under the reauthorized ESEA. Wouldn’t you know that he was in meetings regarding the debt ceiling and had to cancel our meeting…so much for making an ‘appointment’. But, we did speak with his legal counsel in the stairwell by the congressman’s office. There was no place in the office or a conference room where we could meet. Even with a canceled appointment and relegated to the stairwell we did have a meaningful conversation about the points mentioned above. Wouldn’t you know it that Nunes’ office was right next to Speaker Boehner’s office! My wife would not let this opportunity pass so we went in and spoke to one of his aids regarding or NCLB/ESEA points…again well received. Since we still had time we found our congressional representative, Jeff Denham’s office. He was not there but we did speak with his legislative assistant. He seemed wary of us and had a very rigid and inflexible demeanor. After a while he did soften a bit but we could tell that he still was supportive of Arne Duncan’s education agenda. So in all of this we did what we thought we were called to do and then headed back to American University and the conference. Our afternoon session was the one I was most looking forward to. Making Real Reform Stick: Crafting compelling messages for the school reform debate. Who would not want to attend a session presented by Jim Horn, Marion Brady, Bob Schaefer and Sabrina Stevens Shupe? It was superb. All that I asked for and more. It began with Jim’s excellent details on how to make the connection between poverty and testing. His admonition that it is extremely difficult if not impossible to have a meaningful dialogue with corporate reformers. His conclusion is that power concedes nothing without demand. Time for talking is over, now we need action. Bob suggested that when dialoguing with the public start where they are at. Use simple language, not ‘educationese’. Use public opinion poll results to begin the conversation http://fairtest.org/testing-public-opinion . In discussions proceed from the specific to the general. When discussing educational issues begin by talking about their children and then about all children…etc. Sabrina and Marion emphasized to keep the core of the message simple. Engage their curiosity by making them want to know more about what you are sharing. Use concrete examples that are vivid and memorable. Appeal to their emotions as to what really counts and where possible use real life stories to help them connect. When using numbers make it simple, eg. rather than saying ‘20%’ say ‘1 in 5’…rather than saying 15 million kids in US live in poverty say these kids can fill Yankee Stadium 300 times..like that. At the end of the session we were all ready to march…. The most uplifting thing was the people-from all over the US and even some from Canada. Talking and sharing with them we knew we were not alone in this quest to bring sanity to our students, teachers and schools. It confirmed that we were not crazy in our passion for healthy and life-giving public schools free from the threats of testing and corporate management. After nearly 21/2 hours in the sun, listening and cheering we were ready to march. We were given a great sendoff by Matt Damon (his mom is a teacher) ,who flew in from Vancouver just for the march: http://www.youtube.com/watch?v=HqOub-heGQc&feature=player_embedded#at=43 . 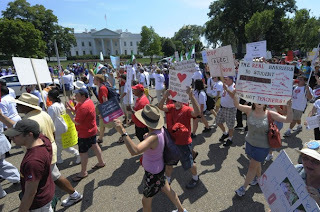 As the march proceeded along the hot street pavement for nearly an hour, amidst singing and chanting we arrived at the rear lawn of the Whitehouse and stood there for a while as we asked for changes in our national educational policies. We couldn’t help but notice two small but vociferous groups of Syrians who wanted their positions heard. Mounted policemen arrived to break up the conflicting groups. I admired the passion for their cause and wondered what changes we could effect if we had 500,000 rather than the estimated 5,000 if us. Could our advocacy be heard above the rancor over the debt ceiling taking place a few hundred yards away on that same Saturday? Eventually we succumbed to the oppressive heat and near exhaustion and lumbered toward our hotel a few blocks away. My wife had near heat stroke and luckily we came across a Starbucks where we loaded up on cold drinks and the refreshing air conditioning before continuing the trek to our hotel. Would we do it again? In a heartbeat! The organizing that the SOS planning team did was astounding. They covered every eventuality they could think of –even providing water and hand fans for all of us. The convention at American University was awesome. We had the opportunity to network with wonderful parents and educators across our country and Canada. This is a powerful beginning, which should spawn a national movement that will give our legislators and the President indication that the current state of affairs and the Arne Duncan’s plan to rewrite ESEA are not acceptable. Parents, educators and students want a say in this process.